The recent European Resuscitation Council (ERC) First Aid Guidelines 2015 state that when direct pressure cannot control severe bleeding, haemostatic dressings and tourniquets are to be used. This is due to the wealth of evidence available that shows how effective tourniquets and haemostatic dressings are when they are used in these situations. 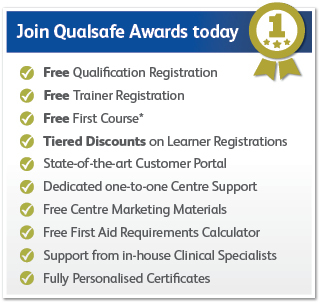 In light of these guidelines, Qualsafe have designed an e-learning course that allows First Aid Trainers and Internal Quality Assurers (IQAs) to gain all of the essential information needed to safely and confidently teach tourniquets and haemostatic dressings on training courses. Tourniquet or Haemostatic Dressing – Which First? Do All Employers Need to Buy Tourniquets and Haemostatic Dressings? Upon successful completion of the course, candidates will receive a certificate of completion worth 3 CPD points, ideal for proving competence in this subject.